With the advent of digital photography we have seen an explosion of content creators leveraging high quality/low cost means to design captivating visuals. A few years ago creators could go from small handheld cameras, to their laptops, to the web quite easily and within minutes. With current smartphone technology, the realm of possibilities are almost endless. People are taking video from their phone, bypassing the laptop and going right to YouTube…in an instant! In June of 2012, Vine was founded and was acquired by Twitter just a few months later. With its six-second looping video format, creators could showcase their creativity in new and exciting ways. Vine quickly became one of the most talked about apps and brands were quick to jump on the bandwagon. Instagram, already popular among the digital photo-elite, unleashed 15-second video capability one year after the launch of Vine (Complete with filters!). Just last month, Twitter enabled direct video capture capability for up to 30-seconds. Sometimes 6 (or even 15) seconds is just not long enough. Then there’s Facebook. With its up-to-20-minute (or 1GB) auto-playing, news feed obstructing videos, Facebook is giving YouTube (and Google) a run for their money when it comes to organic video views. Business Insider announced on February 16th that photos were now the least effective medium for reaching your fan-base organically on a Facebook Page. Videos are now the most effective. 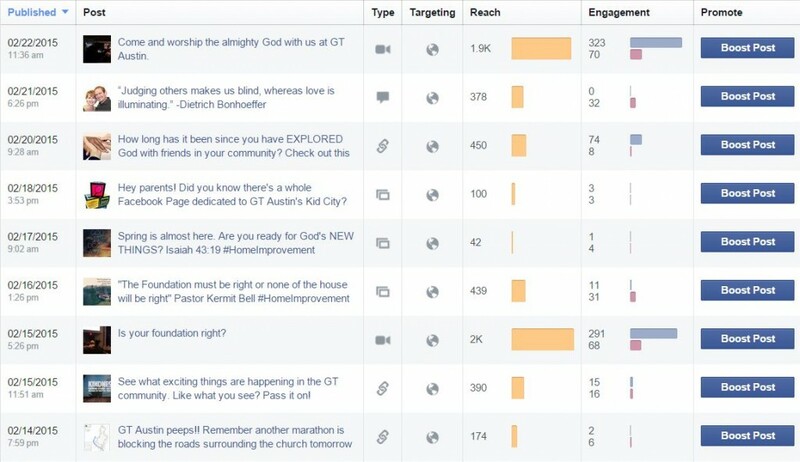 February 15, 2015: GT is an Austin-based church where I was able to post a short 14-second video to their Facebook Page resulting in organic reach of nearly 2000 individuals. February 22, 2015: One week later, I repeated the test with an almost two and a half minute video that garnered freakishly similar results. In the same period all other types of posts averaged only an organic reach of 281 individuals (Touché, Monsieur Video!). February 18, 2015: The Social Media Breakfast Facebook Page posted a video announcing the opening of a position on the board resulting in almost double the number of individuals reached as there are fans of the Page. This is a page that, although there is around 1000 fans, their organic reach is typically only double digits. The fact that the video has been seen over 600 times (to date) gave some of the organizers a reason to sit up and take notice of the power of direct to Facebook video uploads. 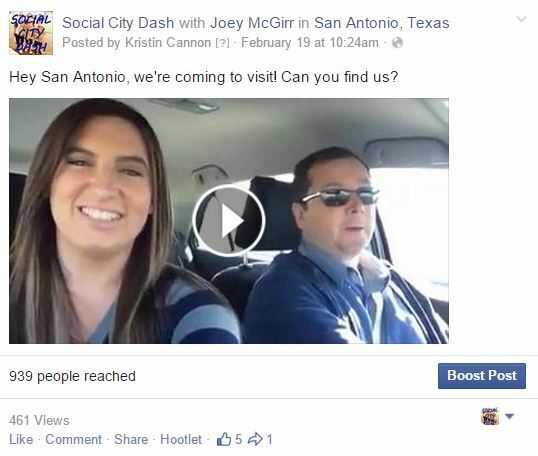 February 19, 2015: One of my newer ventures, the Social City Dash, I tried another experiment. A Page with only around 600 Likes and a simple 14-second video resulted in an organic reach of nearly 1000 individuals and 461 views. We decided that day to refocus content (for the time being) on producing as much video as we could for future Facebook posts. Apply the appropriate message and Post! That’s it! Now watch your organic reach climb over the next 24 hours. 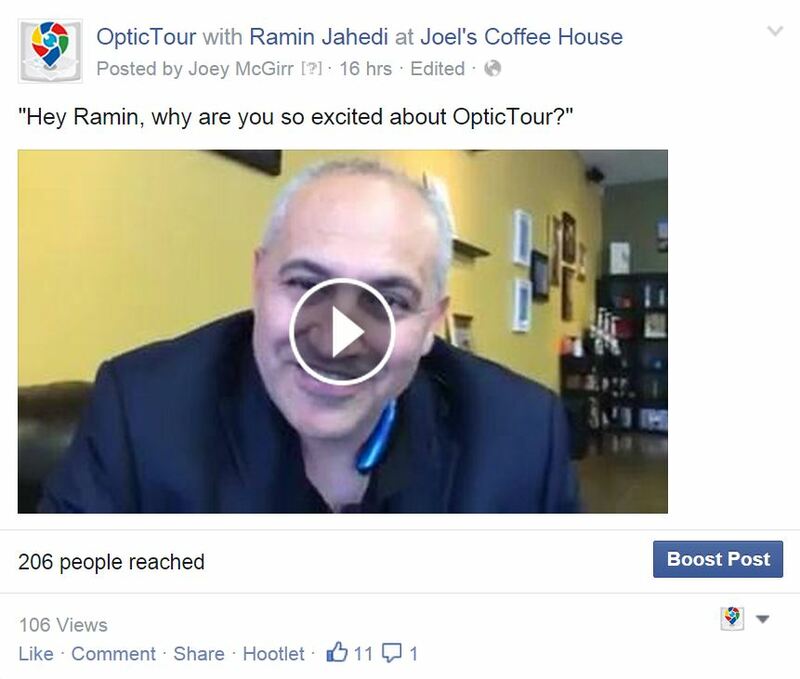 I did this for my friend Ramin Jahedi two days ago on a page that only has 84 likes and in 16 hours that video has reached 206 individuals (35 were Fans, 175 were Non-fans) with over 106 views, all organic. Compare this with his average post which reaches between 7-22 individuals. I get almost daily messages from Facebook and Twitter, asking me to consider paying to advertise my videos. It’s an effective strategy, on their part, as I am certain many business people are seeing the results and wondering how much more they could get if they paid just a little. Remember that it wasn’t very long ago that photos were the most effective way to gain organic reach on Facebook. Will this last? Probably not. So you better act fast. Come up with some pithy video content and get it out there on your Facebook page NOW! One last thought on Online Social Video: Let’s not forget Google. No limit to length or quality. The only limit is the size of your Google+ following – Oh, and the folks who use Google for search (Like, everyone?). Google+ Hangouts are still a very effective way to reach your audience…depending on your audience. Not to mention the ability to auto-publish Hangouts, instantly, to YouTube. Oh, look! We’ve come full circle. In the end, upload to your Facebook Page, Vine, Instagram, Twitters and YouTube because video is the future (and the past) of Social Media! This entry was posted in Communicating, Connecting, Knowledge & Skills, Social Media, Tools and Methodology, Video. Bookmark the permalink. ← I Wrote a Blog, Now What?